Up-and-coming cross-country skiing stars, Reed and Ty Godfrey, have the unusual luxury of a best friend, top-level teammate, and sibling, all in one. They are twin brothers, born 20 seconds apart – and while they’re hugely passionate about their sport, they consider themselves more as teammates than competitors. “We’re always pushing ourselves and challenging each other, but it’s way different than with anyone else. If I beat Reed, it’s in a fun way, and there’s no one I would rather be beaten by, than him,” Ty says. Growing up in Canmore, Reed and Ty have been on snow since age one, and cross-country skiing with Canmore Nordic Ski Club since a young age. 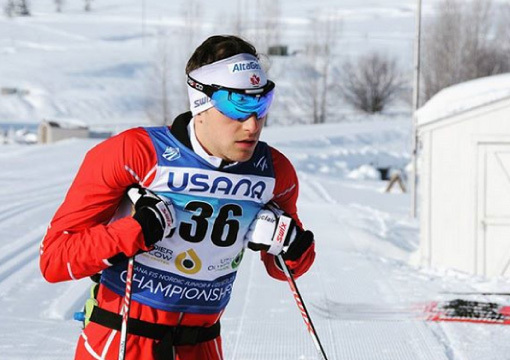 Today, the Godfreys are names to watch in the cross-country ski world. Winter 2016/17 was their break-out season – representing Canada for the first time in the Canadian Junior Team, and qualifying for the World Juniors. “My dream is to get to the Olympics. Without success and growth now, that goal isn’t possible, so my current seasons are just as important. In 2017, I placed 25th at World Juniors – and on the world stage for Canada, top-30 is breaking point.” Reed says. “We won our first Nationals gold medal for the team sprint as partners in the open category, out of everyone in Canada. It was great to share that first gold. And when we got the phone call to tell us that we qualified for World Juniors, that one moment made the thousands of hours we’ve put in all worth it,” Ty says. “It was our first winter out of high school, so it was our first season where we could make our training our priority. We didn’t have school or homework to think about. It was definitely a shift, being able to put training and racing above everything else,” Reed says. “Winter 16/17 was also our first time competing in an open age level, with competitors from different countries, and older, higher-level athletes. I had the race of my life in Soldier Hollow, Utah, in 2017, and got a ton of exposure. It was a break-out year for sure,” Reed says. In 2018, Reed and Ty will mark 19 years of skiing, and celebrate their 20th birthday. They have been members of the Pauw Foundation’s Youth Sport Fund since 2016, which provides financial support for travel and accommodation costs for young, high-level athletes in the Bow Valley. “Skiing is an expensive sport, especially in Canada. The equipment, training, camps and travel costs really add up, and it’s hard to get funding. This support this is so important for us – it really helps and it’s allowed us to relax a bit,” Reed says. “We do two training sessions a day, and work five days a week to fund our sport, so it’s great that we love our jobs outside of skiing, too,” Ty says. When asked about the keys to their success, Reed and Ty credit hard work, passion for their sport, and the support of their parents, friends, coach, and team. They are now part of a new high-performance ski team, dubbed Team RAD (real athlete development) at Canmore Nordic Ski Club, where Alain Parent has coached them since 2012. “After we finished high school, our coach didn’t see a program that would be suitable for us anywhere else in the country. So he designed this specialised program with us. It was great to hand-pick athletes and other coaching staff with sports psychologists, and build in the aspects that we wanted for our team, from the ground up,” Ty says. “The team dynamics strike a really good balance – when we’re training it feels like we’re having fun with our best friends. Then we’re serious when we need to be serious,” Reed says. This season Reed and Ty are continuing to reach for the top and following a packed training schedule, including three high-altitude training camps at the Haig Glacier in late 2017. “My goal is to be at the peak of my fitness each time I compete. You need to love what you do – not just the outcome, but the process of training. I try to focus on things I can control, my preparations, my technique, instead of positions or results,” Reed says. Thinking about the future, the brothers aim high, but focus on the present. “Our training plan is for 365 days, so I usually put my focus on the single year that I’m training and racing in. Each season can affect where you see yourself in the future, so I’m taking it season by season,” Ty says. “My dream is to get to the Olympics. Without success and growth now, that goal isn’t possible, so my current seasons are just as important. In 2017, I placed 25th at World Juniors – and on the world stage for Canada, top-30 is breaking point. This year I want to do better,” Reed says. And their best advice for younger skiers who are also aiming high? Enjoy it, and get creative! “Keep it relaxed and keep it fun – you don’t need to be serious all the time. Being creative with the sport was the biggest thing that made us enjoy skiing. Even in the off-season, we like to do jumps and tricks on cross-country skis, and just have fun with it,” Ty says. 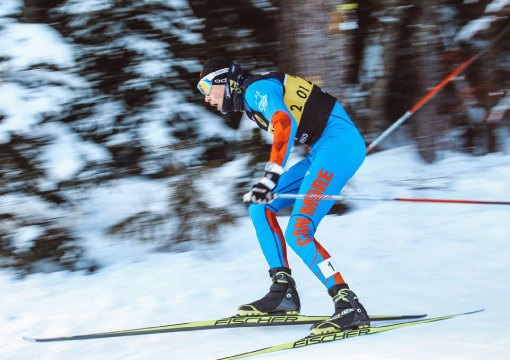 “It’s great to have the support of all the younger athletes [at Canmore Nordic Ski Club]. It gives you a lot of energy and motivation. One thing they tell us is, ‘we didn’t know that you guys have so much fun while training’. We always tell them that’s really important for us,” Reed says. “We ski because we love it – we wouldn’t do this otherwise. I’m definitely not the best at X-Box, and I had to turn down a lot of fun things like high school parties, but it was definitely worth it. And it still is,” Reed says. While their sport has required lifelong commitment, Reed and Ty say it hasn’t been a sacrifice – because there’s nothing they’d rather do than ski. The Banff Lodging Company and Pauw Foundation congratulates Reed and Ty Godfrey, who were recently selected to represent Team Canada at the World Junior Championships in Switzerland, coming up later this month (January 2018). We wish Reed and Ty Godfrey all the best for their continued success, on and off the snow! The Foundation provides funding grants to Bow Valley sports clubs and local high-level athletes to support training, development, travel and accommodation expenses incurred for their sport. The Pauw Foundation is now inviting applications for the 2018 funding round for its Youth Sport Fund for Clubs, and the Banff Lodging Company’s Athlete Sponsorship program (open to high-level athletes in the Bow Valley, aged 14-26). The deadline for applications is February 9th, 2018.